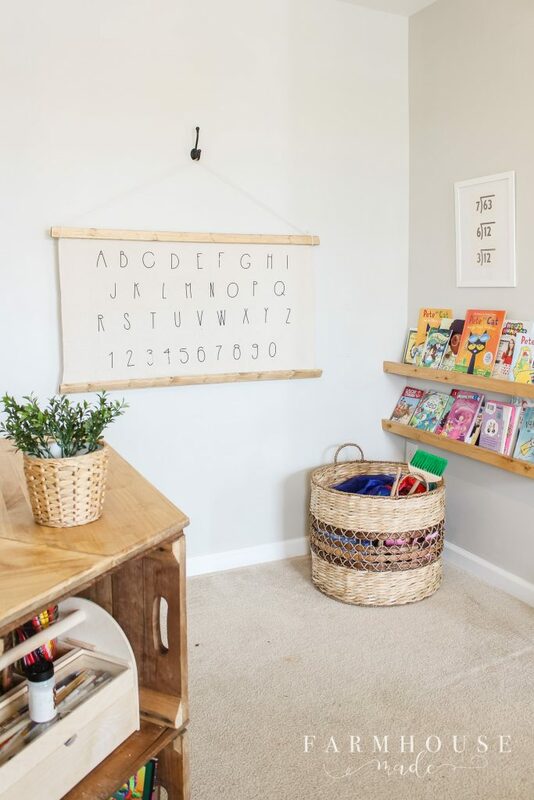 Learn how to make your own Alphabet Wall Art with a few simple steps! This piece was so quick, looks great, and fills up a huge space perfectly! The walls in this playroom have had nothing on them for a LONG time. Like, years. 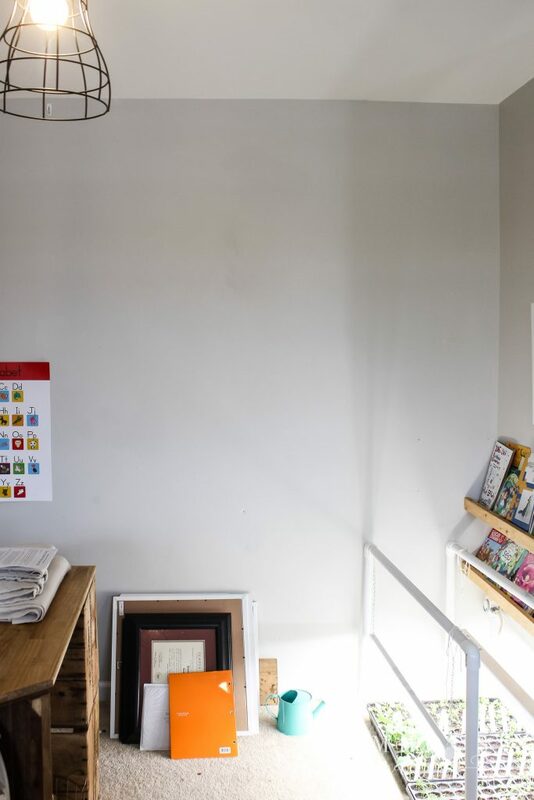 The occasional kid artwork on paper, the random scribbles from a certain young blonde child done in Sharpie on Agreeable Grey Drywall, and a few printables with some cute phrases on them, but nothing else remotely cute to speak of. This post contains affiliate links for your convenience; see my full disclosure here. EVERY(ISH) FRIDAY, THE PURPLE HYDRANGEA, 1915 HOUSE, AND I GET TOGETHER AND BRING YOU A SUPER SIMPLE, FAST FIX TO SIMPLIFY AND BEAUTIFY YOUR HOME AND LIFE! This week, Sarah is helping us choose houseplants we can’t kill! I think it’s worth mentioning too, we got rid of the giant storage unit in here and on a weekend when Andrew was out of town, I made a shelving unit from two ladders I made. Then I put super adorable baskets on it, and that lead to a purge session, and a cleaning session, and me staring at an empty wall above the book ledges. You know, one thing leads to another project… or four. This wall is the only real big wall, so I felt like it needed a little something. Also, this room always benefits from a good solid round of putting-things-away. Right!? Blah. While purchasing baskets, I ran into a piece of wall art I liked, but wasn’t wanting to pay all the many dollars, and I didn’t quite like the font, or the color, but the vibe was my jam. The cure for that, is to make your own alphabet wall art. There are a more than a few ways to make one of these. Furring strips or dowels for the top and bottom, whatever string, and the letters can be paint, sharpie, stencils, pre-made letters for iron-ons, or vinyl. It’s totally up to you to be creative, or get your kids to write or paint the letters. I cut my wood pieces, sanded, and stained them, set them aside to dry while I made my letters and cut fabric. If you don’t want to use a Cricut, go ahead and lay out your letters or paint them on now. 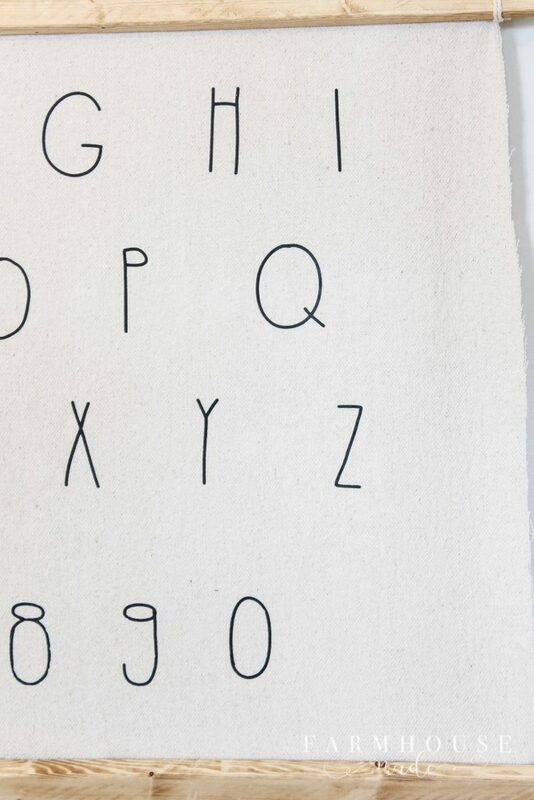 If you’re doing vinyl, type out your alphabet in Design Space in a font you like, ready your mats, and cut away. I’m still learning the Cricut ropes, so instead of confusing you with a tutorial on how I did it, I’ll direct you to YouTube instead and save your sanity. Weed and trim the letters, lay them out on your fabric, and iron those babies on. Once your letters are ironed (or dry), and your furring strips are dry, get your hot glue and hot glue the fabric to the back of the wood, leaving an overhang on the edges. Tie your string on that overhang, and hang it up! I hung this on a cute hook I found in the garage, but you can hang it on whatever! 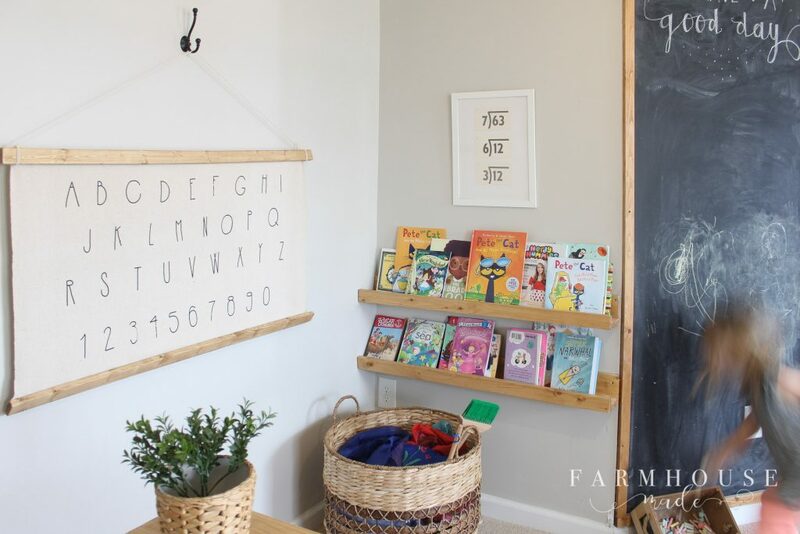 I love how it fills in the space on the wall, and the kids love to play school and started using it as soon as I hung it up. 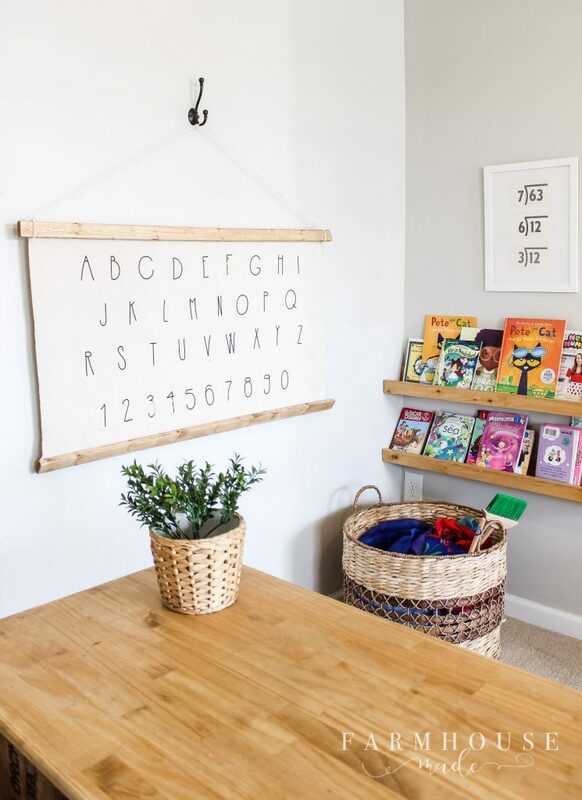 By the way, if you’ve got a Cricut, I am accepting ALL tutorials over on my FB page – I have only made a few signs, tee shirts for the kids, this alphabet wall art, and a travel coffee mug for my favorite school bus driver ever. I know I’m using it minimally, so please drop me your favorite projects on our FB page! Gosh, is there anything we can’t do with a drop cloth???? Gah!!!! No way is this that easy!!!! I could even do this!!! This would be perfect in our homeschool room!! It is very fun. Really very awesome.